 Smoking and non-smoking casino floors with roulette,blackjack and poker tables, as well as action-packed slot machines.  The Salon Privé - for top-end gaming - one of the finest and most upmarket in Southern Africa.  The elegant 5-star Royal Sibaya luxury boutique hotel, for exclusive use by top-end gamers. The Imbizo Conference Centre - a 1 000m2 multipurpose venue that includes a pre-assembly area and breakaway facilities, used for conferences, exhibitions, banquets, gaming promotions, etc. A boma area for up to 250 people also offers an extension of the conference facility for team building and other events. The iZulu Theatre - a thatched theatre capable of seating an audience of 577 people. The theatre opened with the internationally acclaimed African Footprint production and has seen major productions grace its stage, including Umoja, Bounce, Tap Dogs, Bollywood Crush and Michael Jackson HIStory II. The iZulu Theatre is ideal for theatre events, product launches and conferences. Krakatoa, Sibaya's volcanic eruption three-tier show bar, is one of the most happening nightspots in town, but is also used for functions and launches. Restaurants: The celebrated Aqua - a speciality seafood restaurant with an extensive à la carte menu, sushi bar and teppanyaki tables; A2A theatre of food and deluxe exotic buffet; the Royal Grill Steakhouse, an intimate dining experience; Africa to Asia treats guests to seven island buffet stations offering a selection of Asian, Middle Eastern and South African cuisine. Experience true African indulgence at the awardwinning Mangwanani Private African Day Spa. 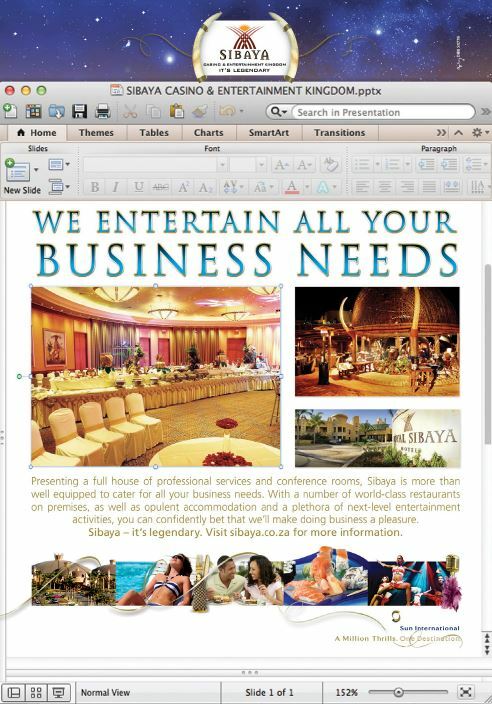 Sibaya is a venue of choice for conference and wedding planners, as well as marketers for product launches and functions. To be recognised as the pride of African Casinos. This Durban hotel and casino is a magical kingdom situated north of Durban central, between Umdloti and Umhlanga. Only minutes from Durban's King Shaka airport, Sibaya's Durban casino is the ideal, central location for conferences, functions and that quick little getaway. Sibaya Casino and Entertainment Kingdom offers an exciting casino, a cultural fusion of culinary delights, sublime shows and ever-evolving winning opportunities. Experience the dazzle and the delight whenever you walk through the doors of Afrisun KZN's Sibaya Casino and Entertainment Kingdom. With expansive views over the warm, Indian Ocean as well as inland views over the beautiful rolling hills of Zululand, you have the best of nature combined with cutting-edge design and architecture, incorporated into one exciting venue.